Hristo Karastoyanov (born on February 22, 1950, in Topolovgrad) is a contemporary Bulgarian novelist. He studied Bulgarian Philology at Plovdiv University and made his debut in 1981 with the short story collection Cracked Asphalt. He is the author of 27 books – fiction, political journalism and poetry. His novel Autopia: The Other Road to Hell, 2003, is in the list of the first five books nominated for the Vick Foundation Award. Other books of his (Nefertiti in a Dark Night, 2001, Death Is of Preference, 2003, Consequences, 2005, Resistance.net, 2008), have been nominated for the Helicon Bookstore award, including his novel The Spider, 2009; 2011. In 2014, Karastoyanov’s book The Same Night Awaits Us All: Diary of a Novel  (Janet 45, 2014) won the Pencho’s Oak award for significant contribution to the contemporary Bulgarian literature and its research, as well as the Helicon award for best fiction book of the year. For her translation of an excerpt from the novel into English, Izidora Angel was awarded a Translators’ Residency at Open Letter Books, US, organized annually by the Elizabeth Kostova Foundation (April, 2015). 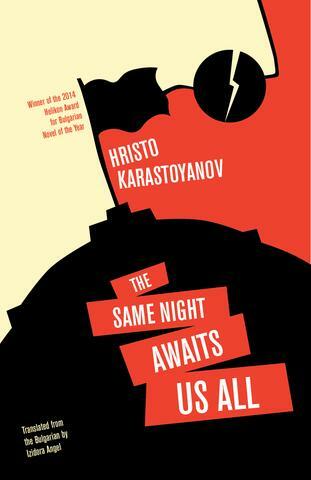 In January 2015, The Same Night Awaits Us All won the Elizabeth Kostova Foundation’s annual contest for translation and publication of a contemporary Bulgarian novel  into English. In January 2018, Open Letter Books released Karastoyanov’s novel in US in a full-length translation from the Bulgarian by Izidora Angel. He has been awarded a number of literary prizes, including first prize in the Razvitie unpublished novel contest (for his novel Death is of Preference, 2003): an award from the Bulgarian Writers’ Union for Notes on Historical Naiveté, 1999; the Golden Chainlet short-story award from Trud daily; and the national Chudomir Award for a humorous story. His book Kocama Karı Arıyorum in Turkish (Wanted: A Wife for My Husband), 2006, was presented at the 25th Istanbul Book Fair (2006). Hristo Karastoyanov is a member of the professional Bulgarian Writers’ Union. He works and lives in Yambol. He is married, and has a son and grandchildren. In 1954, the remains of the great Bulgarian poet Geo Milev were uncovered in a mass grave at the outskirts of Sofia, nearly thirty years after he had been secretly executed by government agents. He was recognized only by the blue glass eye in the right socket of his skull. It had replaced the real one he lost fighting for the very country which would order his execution for publishing the politically nonaffiliated—and therefore inconvenient—periodical Plamuk. “Night” imagines and revives the last year and a half of the legendary poet’s life and the events leading up to his death, while resurrecting his friendship with the legendary in his own right Georgi Sheytanov—notorious anarchist on the run, most wanted man in the land, and, crucially, financial sponsor of Milev’s periodical. It’s probably very natural to frame the book around the question “Who killed Geo Milev?”. It’s a loaded question, raising many more with it in regards to Bulgarian and European early 20th century history, politics, and culture. But perhaps before attempting to answer who killed Geo Milev, we need to ask, “Who is Geo Milev?”. Because if we don’t, it means his life, his work, and his death have been forgotten. In early 1920s Bulgaria, the international literary promise of the young visionary poet Geo Milev—German-educated, avant-garde writer, multi-lingual translator, and magazine publisher—is unbound. He is contrarian, brilliant and erudite. Following severe injuries sustained while fighting for Bulgaria in the Great War, Geo Milev continues to work fanatically and almost obsessively in a race against time to expand the horizons of the Bulgarian literary landscape. The writer becomes one of the fiercest apologists of modernism and expressionism, authoring potent poetry and sweeping political commentary, and translating into Bulgarian no less than Lord Byron, Shakespeare, Goethe, John Keats, and de Musset, to name some. In turn, he is despised by the conformist literary circles, the pseudo intellectuals, and, of course, the government. We know the ending, yet we breathlessly follow the last year and a half of the prolific poet’s life as resurrected by Karastoyanov’s chronologically deconstructed narrative, imbued entirely in the inferential mood—a tense which alleges the occurrence of events and dialogue. The narrative simultaneously weaves in real people and real, chronologically intertwined international events while exploring the deeply volatile European climate between October, 1923 and May, 1925, pointing a mirror to inexcusable atrocities committed in Bulgaria as an effort to suppress freedom of thought. From the very first pages of the book we know Geo Milev will die, and we know Georgi Sheytanov will die. They will die because for Bulgaria—a country amidst a five-century-long identity crisis—avant-garde literary propositions, dissent, and anarchism are persecuted with murderous fervor. But the book is unapologetic in the frightening parallels it makes with the Bulgaria of today, begging the question: what has changed, if anything?